Mike Shuttleworth and Mike Shuttleworth Sr. are a father-son team that make up Redline Performance Motors out of St-Louis, MO USA. 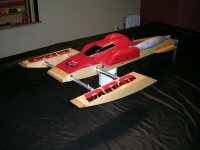 Their company sells a full range of R/C boats, parts, accessories and of course engines. I recently had the chance to evaluate one of their fully modified Zenoah 260 engines. "We are a father and son team. We do all testing and design work together and help each other out. He (Mike Sr.) has the years of experience and I have the desire to make boats go fast. We worked together for 15 years at his Welding and Machine shop. Now we work mostly on the RC boat applications in the shop. He makes all of the jigs and fixtures for the RL hot pipes and I make the tooling for the jugs/pistons we modify. The motors we modify and assemble are run on a dyno 4-5 times to test and check out motor performance. We send dyno sheets out with the motors so the customers can see they are getting their money's worth. We don't try to do the motors on a machine totally as this wouldn't produce the best motors on a reliable basis. To get the best motor we have found to do some of the work by machine and some by hand. This is the only way to get the accuracy we strive for in our motors. We sell what we would run ourselves, this ensures a happy customer. The motors are timed so you can get the rpm and torque in the sweet spot, where you can heat race and have power through the turns and wind up down the straights. Loosen up and make some strut and prop changes to the boat and lay down some big numbers when you just want to get that top speed for braggin rights at your local water hole. The engine (as reviewed) is equipped with a modified Walbro WT-257 carburetor, and an aluminum carburetor block with double Teflon gaskets. The water jacket is custom engraved with the Redline name and stripes. "This motor has all of the torque and RPM you need and then some. This motor is set up for heat racing. Walbro 257 modified carbuerator bored out and entry angle reshaped for better flow. We run all motors on a Trik dyno and send dyno sheets with motors. Motors run around 6+ hp max HP in the 14,500k to 15,000k rpm range." I used an Insane Generation 3 mono as the testing platform. The tuned pipe used was a CC Racing steel pipe with 1" header. I also tested it with a Redline Hotpipe (recomended for this engine by Redline) which performed very well, but my testing was cut short by non-cooperating weather. The pipe used in the attached video was the CC pipe. The motor was fast and pulled well through the turns. After running about 1/3 to 1/2 gallon of gas through the engine I started tuning the pipe length for this particular engine and also the carburetor needles. It turned out the high speed needle setting was even richer than I had initially thought. I was keeping it rich for break-in but after fine tuning it the engine really started showing what it was capable of. Below is a short clip of the motor in action in my mono. If you can't view the video, download it by CLICKING HERE. The Redline motor performed very well in my testing. As it completely broke-in it got progressively faster and stronger. I think it should be a good heat racing motor in just about any boat as it pushed the mono to racing speeds with ease and had a lot of torque, which will also come in handy in bigger boats such as sport hydros and cats. The only thing I would personally have liked to see on the engine I received is a stainless steel bolt/screw kit, but the lack of takes nothing away from its functionality or performance. *Note: I have been informed by Mike at Redline that they now supply the stainless steel cap screws with all modified engines. The Redline Motors Full Mod Zenoah 260 is a very good performer for racers and sport boaters alike and competitively priced. I will be doing a more extensive review on the Redline motor/Redline Hotpipe combo this spring so I will keep everyone posted. Mike at Redline really recommends the two be run together. From what testing I did do with the Redline pipe I can say it seems like a real good pipe. let us know your test results this spring. I ordered six pipes from nfs for me and the other guys in our club, we will test them out when it warms up this spring. thanks again for your imput. I have not...water turned to ice too fast! That is a very good pipe though no questions asked. And it provides a nice broad powerband. I did test the motor with the Redline Hotpipe and it performed very well. More testing to be done when soft water returns.